Full results can be downloaded by clicking here. In the end we had 51 competitors entered into this year’s annual club championships. We would have had a few more but as always, a few people pulled out due to last minute nerves, injuries… or football/rugby matches (!). Registration for the competition started at 9.30am and I’m disappointed to say that the competition started 2 minutes behind the scheduled start time of 10am. All the Individual Kata categories were over with within an hour with some reasonable performances. I’d like to say that some of the Kata performance were awesome but it’s against the Budo code to tell lies! 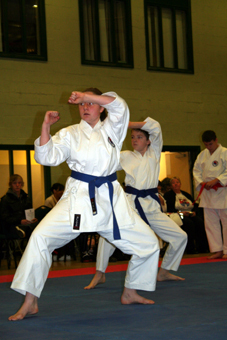 At our Inter-Club (March 2010) and at the Aiwakai Nationals (May 2010) our Kata performances were good, looking at some of yesterdays performances it looks like that standard has slipped a little – but we’ll be back on form for the Aiwakai Kata Comp (December 5th!). It should be noted that for a lot of competitors, this was their first EVER competition and they did great! After the individual Kata, we gave everyone a 15 minute break and informed the Junior’s (Orange Belt – Brown) who they would be paired up with for Pairs Kata. Each Pair’s team then had only 15 minutes to practise together before the category started. In this section I was pleasantly surprised by the coordination in the performances, especially considering how little practise time they’d had. I think this is a great way of levelling the playing field and seeing how good people really are at Kata. 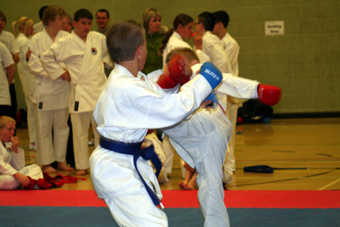 Kumite events started an hour ahead of schedule and before the officials even had their lunch break! 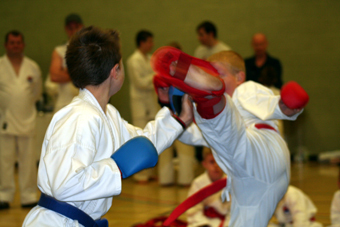 The Pee Wee’s (5-7yrs, White & Red Belt) were great… I’d say that our ‘safety first’ approach during training has paid off with most of the competitors fighting well out of distance – we’ll be building on this over the next few months with them, to get them fighting ‘within range’ more. The Kumite standard more than made up for the Kata standard across all categories, it was great to see some very strong performances from 6 year old Khushru (First Comp, White Belt), Reese (Red Belt), Paul (Green Belt) and Matthew (Purple Belt) as well as the old favourites… (You know who you are!). Once again the crowd were treated to a Connor Vs Jas final, this time with Connor taking the win. All events were finished by 1330 and we were all cleaned up and away by 1430. I’d like to thank all the Officials & Volunteers who ensured the day ran like clockwork, and all the parents and students for coming along and supporting the club.